It’s a new year and a good time to review and renew our commitments. One of my missions is to record for you, and possibly for the pages of history, stories about life in the Shenango Valley of Pennsylvania throughout the middle decades of the twentieth century, the 1940s through the 1970s. I will do so as long as the stories keep coming, whether from my own recollections and resources or from others who wish to share their memories of those times. Another source of remembrances is the publication, “The Way it Was,” a senior shopper flyer that is produced by Eric Bombeck and distributed free of charge in the Mercer County area. The January 2017 issue features a compilation of articles from this blog titled “Dance Hall Days — Angel’s Casino in Sharpsville.” Be sure to check this out, as well as Bombeck’s Facebook page (The Way It Was Mercer County) and his Wednesday broadcasts, 5:00-7:00 p.m. EST on NewsTalk WPIC 790 AM radio (“The Bombeck Show”), all focusing on those days gone by. My brother has always been a friend magnet. Wherever he lived, he had the ability to attract a faithful group of guys who eagerly joined with him in a variety of activities, either mischievous or quite proper, or just gathered around him to shoot the breeze. Even now in his retirement at Angel Acres in London, Kentucky, he can be found sitting at his desk in his woodworking shop holding forth with friends of all sorts. And it was the case when he was growing up Sharpsville, Pennsylvania. Dad had purchased a Heidelberg printing press [for his print shop, The Sharpsville Advertiser, also located on North Second Street] that was shipped in a large wooden container from Germany. The container was the first source of wood. The rest was scrounged from the neighborhood. The Sharpsville youngsters who built a tree clubhouse in their neighborhood last summer are enjoying it even through the winter months with the help of a small electric heater which keeps it almost too warm for comfort. They have electric lights and a radio, and now their big ambition is a television set. That and another project — buying matching shirts — are awaiting an upturn in their finances. The 10 boys, aged eight to 13, who built the house did so on the spur of the moment last July — just to see if they could do it. Now they all enjoy it, and sometimes all ten cram into the house at once. They hauled pieces of materials from here and there, and perched the six by eight foot house about 10 feet up in a wild cherry tree beside the August Angel home on North Second St. They installed a window, a doorway through the bottom reached by wooden steps, wrapped tar paper around the outside, and put pasteboard and [C]ongoleum on the inside. They found a bit of rug for the floor and benches for easier sitting. The house is said to contain dozens of books, although few adults ever see the interior to make sure. A lookout perch is some 20 feet up in the tree. The electric current comes from Angel’s home. Dues are $1 a year, and non-members can spend a day there for a nickel. The treehouse that was featured at the beginning and end of the 1986 movie “Stand By Me” had nothing on the one that Mike and his buddies built and equipped with all those modern amenities. 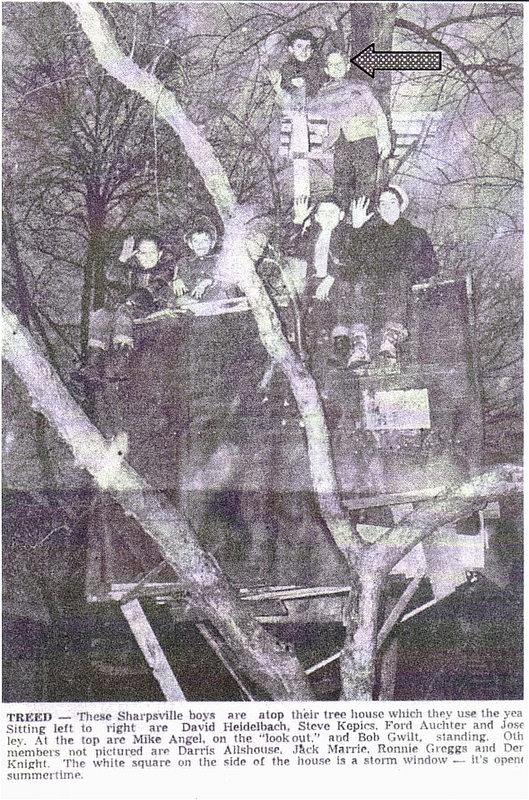 Girls were not allowed inside the treehouse. Therefore, as Mike’s older sister, I can’t say how much the boys’ activities inside their clubhouse — away from the watchful eyes of the neighborhood — compared with those of the characters in “Stand by Me”! After high school graduation, Mike and several of his friends joined the U.S. Marines. Afterward, Mike became a Kentucky State Trooper and earned a degree in Criminal Justice. This was followed by a career as a special agent with the Alcohol, Tobacco, and Explosives (ATF), a federal law enforcement organization, then within the U.S. Treasury Department and presently within the U.S. Department of Justice. Mike was a criminal investigator of bombings, firearms violations and liquor violations (moonshine) in the mountains of WV and KY. He was stationed in Charleston, WV, Cincinnati and Cleveland, OH, St. Paul, MN, and Atlanta, GA. He and his wife, Fredi (Andres), have two children and two grandchildren. 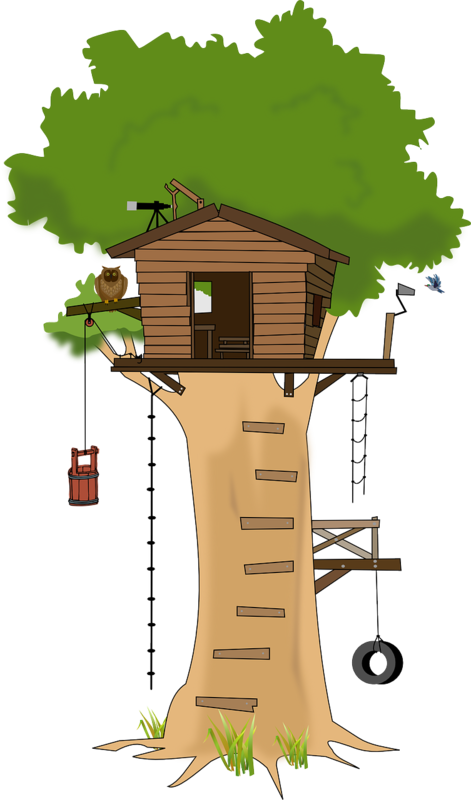 The treehouse was only the beginning of Mike’s creative accomplishments. In spite of a busy work and family life, he found time to study guitar, collect antiques, and build two log homes. Retired since 1994, Mike is the founder and owner of Red Dog & Company, specializing in hand-worked Appalachian-style furniture. Mike has become a master craftsman and he and his son (also an ATF retiree) build finely crafted items which are sold nationwide. (For more information, go to reddogchairs.com or reddogandcompany.com.) And, never one to slow down, he is presently contracted with the U.S Government to conduct background investigations for security clearances. As always, he conducts his businesses, as well as his friendships, with an easy-going congeniality. Throughout the years, Mike has kept in touch with many of his Sharpsville gang. Sadly, some have now departed but his memories of the exploits they shared in Sharpsville during the 1950s will always be with him. Mike Angel (SHS 1960), London, KY, February 2017. Permission to use newspaper article and photograph by The Sharon Herald Co., Sharon, PA, is pending. Great story about Mike, one of my best buddies in high school. I still try to visit Mike annually on my trips back north from our present home in The Villages, Florida. I’m hoping to get Mike & Fredi down to Florida for a visit this winter. What do you say Mike? Let’s set a date.